English Olympics is one of BNEC’s most prestigious events. BNEC have been conducting this event since 2004, starting with the Nationwide English Olympics for 6 years. It then developed into 1 year of Southeast Asian English Olympics, and lastly 6 years of Asian English Olympics with more than 500 participants from Indonesia, Singapore, Malaysia, Thailand, Vietnam, Philippines, Hong Kong, Macao, India, Bangladesh, Laos, Cambodia, and South Korea. 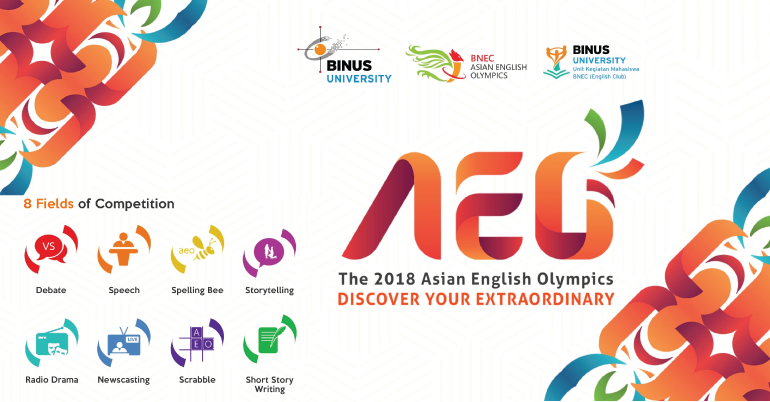 Asian English Olympics (AEO) has come to its seventh year after being first held in 2012, hosted by BINUS University and organized by BNEC. For the past years, AEO has been successfully improving its participants’ English skills, giving meaningful experiences to be remembered, and broadening the networking of the participants across Asia. The 2018 Asian English Olympics with the theme “Discover your Extraordinary” is all about stepping out of our comfort zone and discovering something new in our life. Life doesn’t come with guarantees. That can make it risky and perhaps scary, but it’s also what makes it interesting and fun. As you go through your life, the parts that are going to stand out are not the ones where you plodded along safely and did what was expected of you. The shining memories will be the times when you took a leap of faith, whether you won or not. 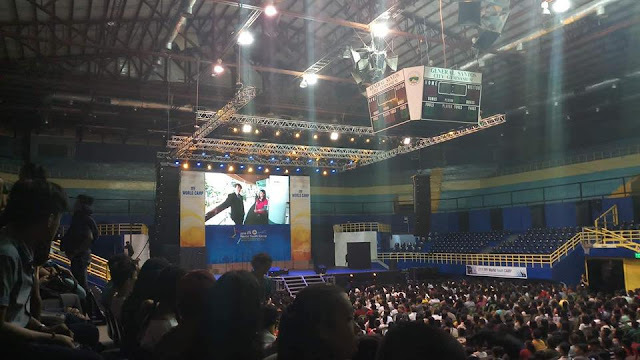 Through the theme this year, the message that’s hoped to be conveyed is for the Asian youths to be brave and bold to step out of their comfort zone. To experience and discover their own meaning of Extraordinary in their life. The 2018 AEO will be held on February 8-12, 2018. This year, the Olympics will challenge its participants in several fields of competition, such as Debate, Speech, Storytelling, Newscasting, Spelling Bee, Scrabble, Short Story Writing, and Radio Drama. As the Olympics, there will be an “Institutional Champion” title for participating institutions. Every delegate who wins in each field of AEO will accumulate points for their institution to be crowned the title. Students will be eligible to participate in The 2018 Asian English Olympics if they are enrolled in secondary school/high school (10th grade or above) or are enrolled in university. Each institution can only send a maximum number of 3 people or teams per field of the competition.